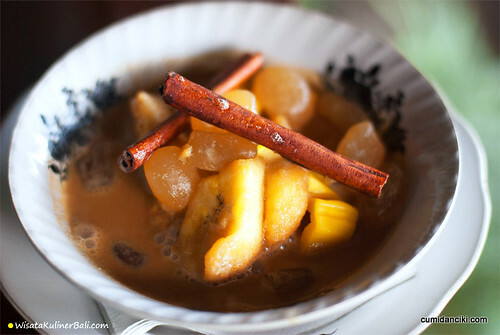 5 terrific Indonesian desserts for the sweet-toothed! Oh.. it’s that time of the week again and I feel like a bit, of BITS! Our Blogger in the Spotlight today is none other than the lovely Gaby, from Indonesia. Gaby is a cool lass who was born in Java but now lives on the gorgeous island of Bali. If you are planning a holiday in Bali anytime soon, look for her – she knows all the great joints of food as well as the best spas in town! Indonesia sure has a comprehensive list of recipes for delicious desserts. With abundant tropical produce such as coconuts, lots of Indonesian desserts use Santan – coconut milk. 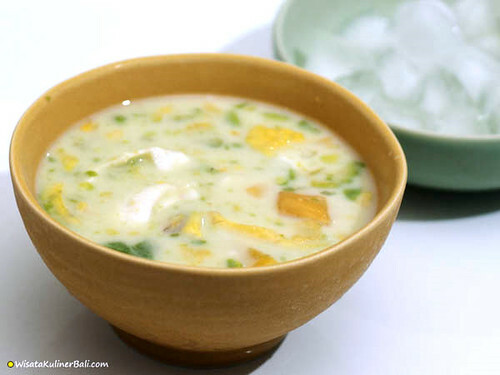 The use of coconut milk is not mutually exclusive to Indonesian cuisine, since it can also be found in Indian, Thai, Malaysian cuisines and there are many overlapping savory as well as sweet dishes that come from these nations. No matter the similarities, if you have a sweet tooth, you will still definitely enjoy these ones listed below, because they happen to be my favourites! Check out these Indonesian ‘drool worthy’ desserts..
Es Teler consists of : Young shredded coconut, avocado, square slices of jack-fruit with shaved ice on top of it. Es Teler is a sweet, ice based Indonesian dessert you can find in almost any food court/stall at any supermarket. BEST Es Teler (legend!) in Indonesia is no doubt : ES TELER 77, founded in 1982. Creamy rich avocado, sweet succulent coconut flesh, juicy fragrant almost pungent jack-fruit.. how can you not hanker for this on a blazing, hot afternoon? I am an addict! I found 2 types of Klepon in Bali : Green Klepon which is rice flour base, and the Black Klepon that employs black sticky rice. What people expect when they eat Klepon is to get this “exploding” sensation of brown sugar liquid in their mouth. I couldn’t stop once I had one Klepon. I’d end up eating the whole pack or 1 full banana leaf cone of the stuff. Klepon is available from traditional Indonesian markets, or sold by a local street vendor that sometimes doesn’t have a stall for their food display. They simply just open a small wooden table & chair under the tree, and people will come to buy Klepon for take away, or just sit on the ground and enjoy watching the man make these cute little juicy exploding balls. Delicious! It’s much easier to find Kolak with various kinds of ingredients during the Ramadhan month. It is not uncommon to see some housewives open a small table on the street and magically become, a “30 day street vendor”. Prices vary from Rp 2,000 for the average tasting, to Rp12,000 for the finest tasting ones. The BEST Kolak I’ve ever had : KOLAK KALIPAH APO in Bandung and Jakarta! Cendol is common in Malaysia too. In Indonesia, just like in your country, it is often sold by roadside vendors, hawker centres and food courts. Only in Banjarnegara, Central Java does this cold desserts go by the name, Es Dawet. Some says Cendol is originally from Thailand but I believe we all have our own tweak on the recipe, giving it a slightly different taste, especially the variation of toppings. Pisang = Banana. Pisang Ambon, Pisang Kepok, Pisang Raja, Pisang Ketip are the different banana types, that you can use to make a Pisang Goreng. These ripe bananas are usually covered with a batter that vary in taste, depending on the flour mixture employed. I made my own Pisang Goreng once, with raisin stuffings, garnished with powdered sugar and strawberry jam. I thought it was pretty good. 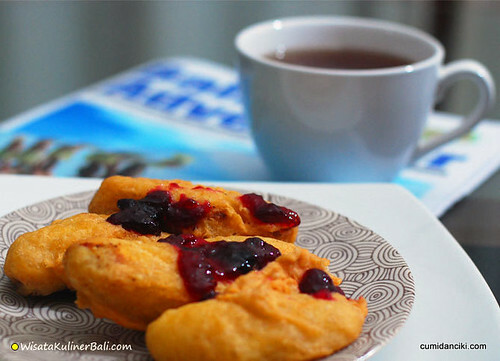 An Englishman in Bali (not in New York) should praise this afternoon tea time with a sip of hot Indonesian tea while reading the Bali newspaper…looking for villa to buy, sir? Gaby is a Java-sumatranese living in Bali who enjoys the laid-back island lifestyle so much.. too much in fact! 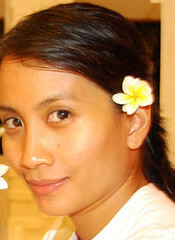 She give us some insights into Bali and its beautiful beaches on www.beeamazing.com , from her local perspective. Next articleBut wherewith for sacred sign? I really have to be in the mood for indo desserts and I do love kelepon. It reminds me of one of my favourite indo desserts, dadar gulung! Great pictures too! This post definitely makes me long for another holiday in Bali!! Looks amazing 🙂 I’m not sure how rice and coconut go together but I would love to try Sweet Coconut Rice Balls! Es Teller is so yummy!!! wow i didn’t know one can have banana fritters with strawberry jam. sounds like a nice combi. But actually the SAMBAL ROA (Sambal Roa is a Manado chili sauce that made by stir fry the chilies, Roa fish-smoked garfish that can only be found in North Sulawesi’s water only- , tomato, garlic, salt, and pepper) itself really suits the banana fritters and they created a unique sweet-savory flavors, that I’ve never encountered before! I’ve tasted Cendol, it’s really good. Not sure about the green though! I’ve had everything but Kolak. Must remind myself to have it when I return. But i must say that balinese banana fritters are yummers! 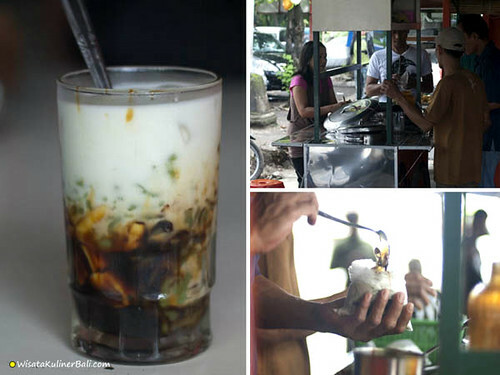 Kolak, Cendol, and Es Teler are my favorite traditional desserts! The Dessert#3: KOLAK served with the cinnamon topping. So tempting! Dear all, thanks for your comments. If I have to choose between Kolak Kalipah Apo in Bandung and Kolak from Cafe Degan in Bali, Bandung is the winner! You should really check out their wide range of Indonesian salad and Kolaks displayed. All yummy! Thanks Ciki!! thank u all for your kind comments! and thank you Gaby for writing such a SMASHING post ! Agree with teler, Pisang Goreng. To me two desserts are kings of desserts…and I think unique to Indonesia. 1) Martabak manis Bandung. The double whammy. Instant heartattack and toothdecay. I always wondered how much calories/sugar is in one piece of martabak manis. I take it with cheese, choclate sprinkles,nuts and condensed milk…cant wait to eat it again. And only in Indonesia can such utter decadence be so affordable. 2) Es Kelapa Kopyor. Special kind of coconut I believe. Love to eat them in combination with otak-otak.